Waterman introduced its first lever-filling fountain pens at the beginning of 1915, though it appears some test-marketing took place before the start of the year. The pens initially shared the same model number system as Waterman's slip-cap eyedropper-fillers, with the addition of "PSF" (Pocket Self Filling) as a suffix. With the change in Waterman's numbering system in 1917, the PSF suffix was discontinued and lever-fillers were denoted numerically by a "5" in the tens place. Waterman hard rubber lever-fillers are handsome, solidly built pens with excellent nibs. Their design varied but little during a production run of over twenty years, a period that spanned Waterman's heyday. Examples are readily available, as are most spare parts. The most common sizes are the 52, shown above, and the 52 1/2V, shown below. Larger pens include the 54 (basically a 52 with a larger nib), 55, 56, and 58, the last numeral denoting the nib size. A pen carrying a #1-size nib, the 51V, was also made. It was an export model, and not sold in the United States. A nickel-silver clip (or ringtop fitting) and lever was the most common trim configuration for standard-sized models in black hard rubber, but gold filled and even solid gold trim was also offered, with various cap and barrel band options. Pens were sold both with and without clips. 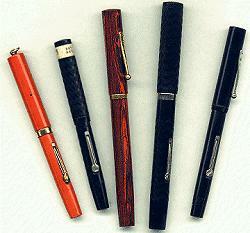 Although Waterman's lever-fillers were initially only made in black, other colors were eventually added, including red and black woodgrain, Ripple, and solid red (Cardinal). From left to right: 52 1/2V ribbon-ring pen, Cardinal; 52 1/2V vest pocket model in black chased hard rubber, with original price band; 52 woodgrain, gold filled trim; 55 clipless in black chased hard rubber, nickel silver trim; 52 1/2 in smooth black hard rubber. The earliest Waterman lever-fillers have a number of distinguishing features, including narrow raised barrel threads and a two-piece pressure bar consisting of a rigid bar attached to a spring. 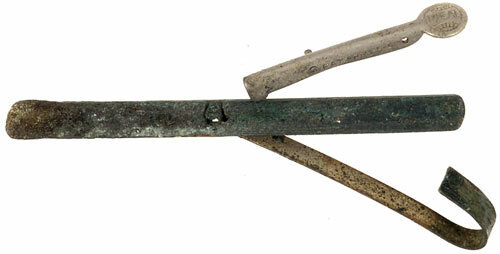 The end of the lever which bears upon the bar is rounded, and does not link the lever to the bar. Waterman soon abandoned this arrangement for a one-piece pressure bar without a spring, bent into a channel on top. Tabs at the end of the lever fit into this channel, toggling the bar to the lever. A bent-up tab at the center of the pressure bar keeps the bar from sliding off the lever. This is the system found in nearly all Waterman lever-fillers, down to the celluloid era and beyond.